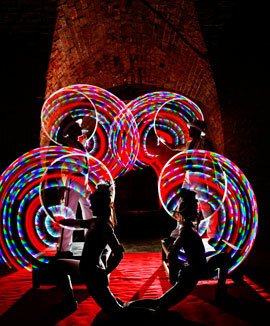 Breathtaking modern circus meets state-of-the-art light-emitting technology. Halo is an explosive, visual stage show using super bright LED (glowing) props to illuminate the complex patterns and textures drawn in the air by two jugglers and two world-class hula-hoop artists. Stunning, surreal, elegant and extraordinary, this hugely entertaining act moves from beautifully presented feats of control and delightfully synchronous choreography to an explosive four-person human-kaleidoscope finale. NOTE Halo artists can also work as walkabout, freestyle or meet & greet performers with a range of LED props and a selection of different costumes. A 2-person version of the show is also available.